In a surprise move, Samsung has started rolling out the official Android Pie update for the Galaxy S9 and Galaxy S9+ owners today. The update is currently available in Germany, and perhaps the best part is that both Android Pie beta testers and those who are on Android Oreo are getting the update. And, for beta users, the official update is a mere 158 MB download, so you should be able to quickly jump on-board to the stable release. To grab the update on your S9 or S9+, open the Settings app, tap Software update, then tap the Download and install option. It may take a couple of tries before the update starts downloading, so don’t lose hope if it doesn’t work on the first attempt. Those in beta markets other than Germany can try as well, although we currently have reports of only Germany having the official update. 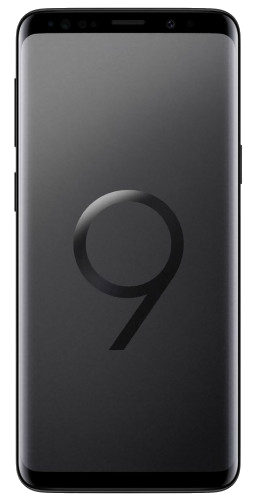 For Android Oreo users, we have the Galaxy S9 Android 9 Pie firmware available for download from our database. Have you received the Android Pie update on your Galaxy S9 or S9+? Once you’ve updated, be sure to check out our One UI (Android Pie) feature focus series of articles to find out what’s new with Android Pie. I have s9 SM-G960F with baseband g960fxxs2brk3 from croatia. Can i flash Germany release rom? 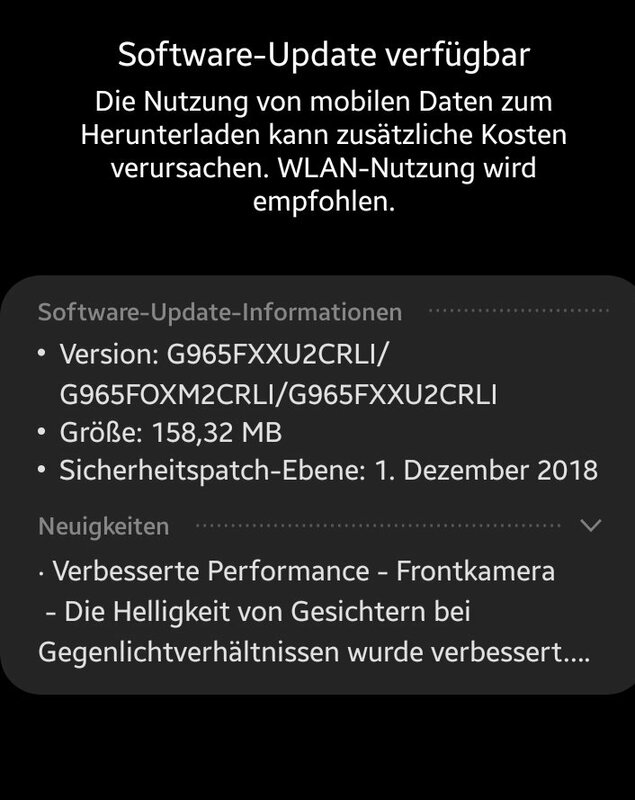 Got the official update OTA in Switzerland. 1756.31 MB for S9+ and 1751.33Mb for S9. maybe unlocked phones only. 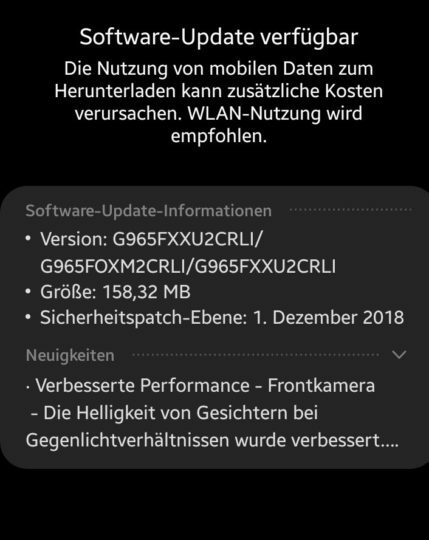 My brothers carrier version in Germany doesn’t have the update. My unlocked one does. Unlocked is always better and faster for updates. It’s why I never buy a carrier phone. Always sim free, unlocked. But hopefully you will have it soon too. It depends on the carrier and when they want to release it. I actually bought it on switzerland, I don’t live there and I don’t have a swiss sim either. I don’t hve any carrier bloatware or splash screen of swisscom. It would be nice but for carrier versions you usually have to wait. But if it’s an unlocked phone it will arrive very soon. But on your post you said you were on Swisscom in Switzerland. How are you on the Swisscom carrier in Switzerlnd if you’re not in Switzerland? If you are roaming in another European country you’re unlikely to get it OTA. It will probably be on smartswitch on your PC if it’s the unlocked phone. However just because it has no splash screen or bloatware doesn’t mean it isn’t a carrier version. Some carrier versions in Germany have no splash screen or bloatware. I have bought my phone in switzerland with csc SWC, I can tell that with the update release date on which I check regularly on sammobile and it matches. I currently live in Kosovo (a small country in Europe)which has not yet any csc of its own. I usually get the updates after the AUT Switzerland, but it happens sometimes to get even before thre AUT. Ok, you should not be waiting too long but if you have a PC try using smartswitch. It will probably be there already. Good luck!